Well, the other half of The Culinary Couple is writing tonight. I may not have the eloquence of my counterpart, but I do know a thing or two about food. Let’s take oranges, for example. When you think of this sweet citrus, what’s the next thing to come to mind? Probably not fish, but they do have a flavor affinity for one another, according to Mark Bittman and The Flavor Bible. And that’s why we chose this dish as the main course for Challenge Oranges. 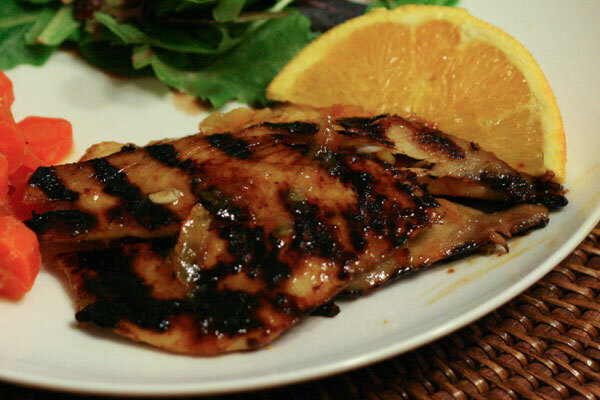 This glaze uses orange marmalade, sesame oil, soy sauce, rice vinegar, ginger, garlic, and orange zest. We chose to use cod because it’s what we had in our freezer, but you could also use salmon or another fish of your choice. 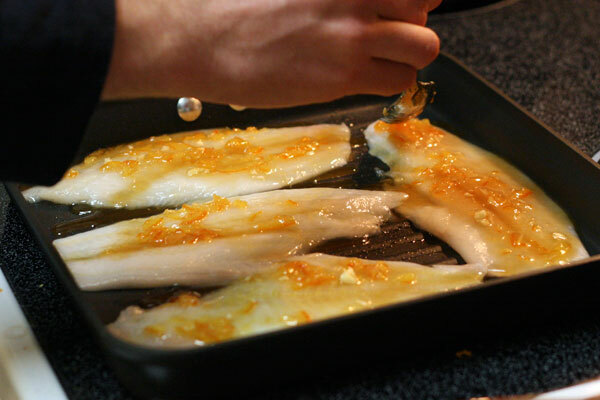 Brush the glaze onto the fish, and cook about 5 minutes on each side. Add more glaze just before serving. We hope you try this sweet, zesty twist on grilled fish. Next us: our side dish. 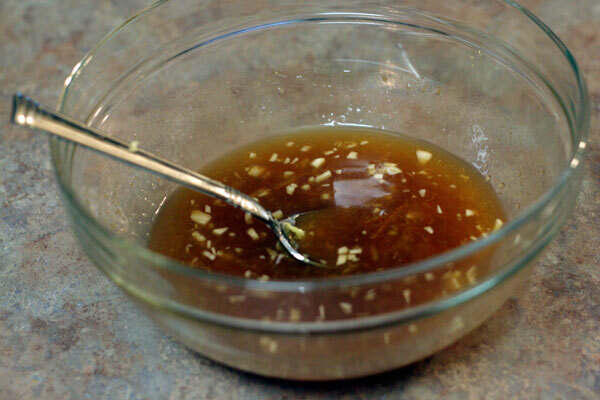 Whisk together marmalade, oil, soy sauce, ginger, garlic, and vinegar in a small bowl. Heat cast iron skillet or grill pan over medium heat on stove top. Brush glaze onto each side of fish; cook about 5 minutes on each side. Serve immediately. I think fish and citrus go really well together (I love fish tacos with mango salsa and lime!). This sounds like a great recipe that can be enjoyed year round. Nick, you dog! Good to see you taking the pressure off the Mrs. for a change. Looks like a nice piece of fish!